This lovely example of a Final Fantasy Black Mage was seen wondering the floor at the Penny Arcade Expo over the weekend. There are no reports of fires started by the arcane creature, or whether he was working for or against the goals and ambitions of the good hearted folk who attended PAX. 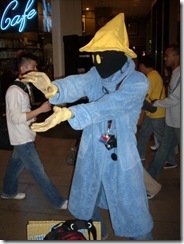 We can only hope that this black mage was a friend of Zidane, but the lack of white cuffs convinces me it is not Vivi.